The tulips are up and open in our fair metropolis. Their brief explosion of color the final reminder that the seasons they are changin’. Spring, by far the most hopeful time of year, brings new beginnings and religious traditions. Unlike the winter holidays; Easter and Passover are of equal importance to their respective observers. Like their winter sister holidays; Easter is the more public holiday and Passover the more private. Homes are not decorated (visible) for Passover, they are cleaned (invisible.) While Easter’s children scurry about (in exquisitely gorgeous outfits) to seek hidden gifts and prizes, Passover’s children search inside their relative’s home for the matzo which will be traded for fabulous gifts and prizes. 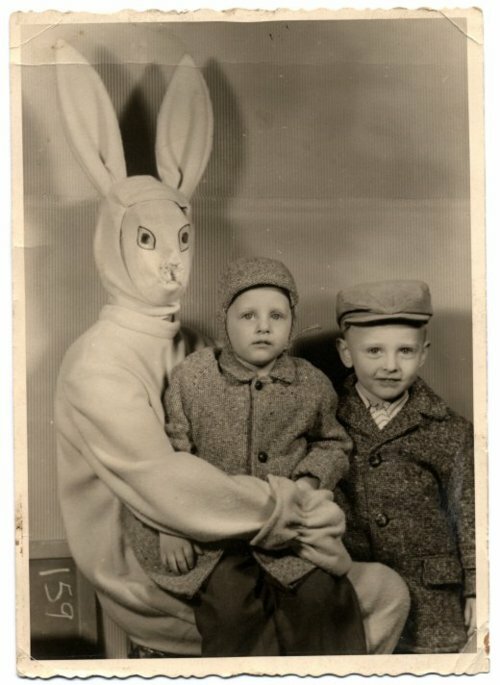 Outside the White House, the lawn will be festooned with egg gathering children, and probably one of those frightening six-foot bunnies, while inside (this) president will be observing a Passover seder. Passover, like Hanukkah is celebrated for eight days (in this country) but unlike Hanukkah it has stayed rather true to its roots and intentions. Shopping malls are dotted with gargantuan bunnies (see above) and plastic eggs hang from limbs across America. For years the winter version of these kinds of displays “egged” people to erect menorahs in town squares. Why are there no giant seder plates or dangling matzo balls? Could it be that preparing for Passover is just too exhausting to be bothered? Or could it be that Passover is so steeped with significance and beautiful ritual that it needn’t try to compete with anything? Whatever the reason, how wonderful that once a year so many in this country celebrate such meaningful holidays without competition or euphemisms. There has yet (to my knowledge) to be a card created, covered in tulips which gently implores; “Happy Holiday.” So before you bite off the ears of the chocolate bunny, or scrape the bottom of the coconut macaroon can, let me be the first to wish you a Happy Easter or a Good Passover.